The 6 balance exercises below have helped many of my clients who had difficulty walking due to pain, past injuries or other medical conditions. I recommend using a kitchen counter to steady yourself for these exercises. Countertops are sturdy and they are at a good height for holding on as needed. Practice these exercises 1-2 times per day for best results. Hold on to the counter only as much as you need for safety during the routine. As your balance improves, lessen your grip on the counter so that the exercises will continue to challenge your balance. Stand in front of a counter with just enough room to raise your knee in front. Maintain good posture as you slowly raise your knee to the height of your hip joint. Lower slowly and repeat 10 times--1 side at a time. Once you can go through the full range of motion with good posture, try alternating legs. (Switch from left to right.) When you switch legs, stand still and don't let your weight shift side to side. Progress to 20 repetitions. This time raise your leg backward as if to kick your behind with your heel. Remain upright and don't let your knee go forward as you bend it up. 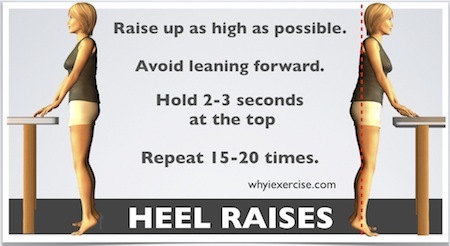 Lift your heel as high as possible and slowly lower it to the start position. Repeat 10-15 times on each side, progressing to 20 or more. 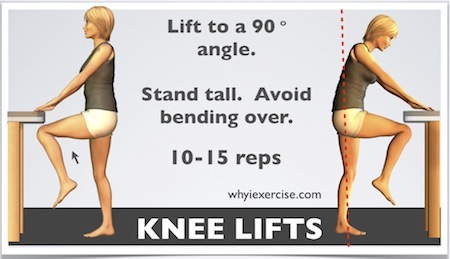 *Alternating legs is not necessary with this exercise. Go up on your toes as high as possible without shifting your body weight forward. In other words, go straight up. Stay up and maintain your balance for 2-3 seconds. Keep your weight over your big toes as you go up and down. Repeat 12-15 times to start with. 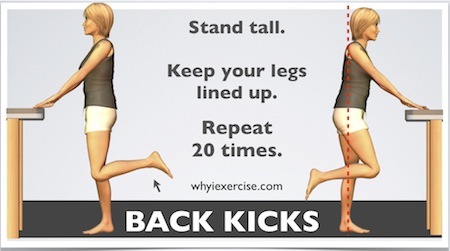 Once you can easily do 25 repetitions, try lowering back down on one foot. Then progress to single leg heel raises. Face the countertop with both feet pointing straight toward the counter. Walk sideways without sliding your feet. (Pick your feet up.) 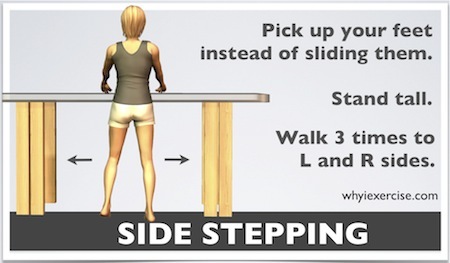 Also, as you are walking, continue to face directly toward the counter top. Don't twist your body or turn your foot in the direction you are walking. If you have an 8-10 foot counter, try going 3 times in each direction at first. If it's shorter, go 1-2 more times. Try to reach the point where you no longer need to hold on to the counter. Here's an effective progression for the most well known of the balance exercises. (a) Stand on one foot, eyes open, holding on. (b) Stand on one foot, eyes open, holding on lightly. (c) Stand on one foot, eyes closed, holding on. 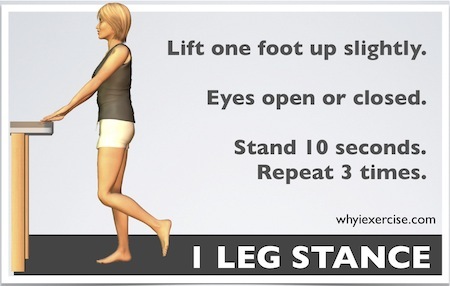 (d) Stand on one foot, eyes open, hands free. Begin with your R foot up on a 9” stair step*, holding onto the rail, and also a cane or partner's hand if needed. Lean forward slightly, and then raise up to stand fully upright. Leaning slightly forward again, lower slowly and under control to return to the starting position. Watch that your knee doesn't drift to the inside of your ankle during the exercise. Repeat up to 10 times on each side. 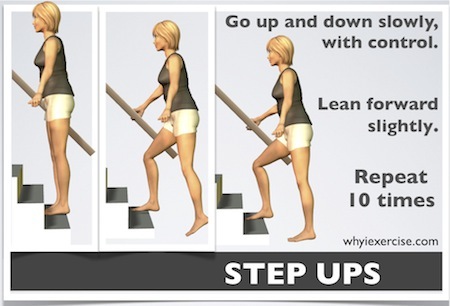 *If a full size stair is too difficult, try stepping up on a large book about 1/2 the width of the stair. Then later you can graduate to the full size stair. Use bursts of exercise for calorie burning and a boost in your cardio fitness. Beginning and intermediate workouts are illustrated, including drills that improve your balance and agility. Target the thigh, hip, gluteus, and calf muscles that support and control the knee joint. Strengthening and balance exercises improve your muscle tone while reducing your risk of injury. Return from balance exercises to physical therapy exercises.